You've just finished teaching a writing mini-lesson to your class, and now you send them back to their seats to dive back into the drafts they've been working on this week. You look at the clock. You've actually managed to keep your mini-lesson relatively "mini" today, which means your class has a nice chunk of time to write independently. You walk over to your desk and take a swig of your room-temperature coffee to celebrate the moment. Ahhhhh. It's easy to let this time slip away drinking room-temperature coffee "supervising." But you have this nagging desire to... well, teach. So how can you make a difference? How can you use this time, be it twenty-five minutes or five, to help students become better writers? Holding one-to-one writing conferences is powerful and a classic component to any writer's workshop model. Whether you keep a strict schedule and extensive records, or use a simple chart like the one started below, when you meet with an individual student about their writing, those focused couple of minutes can directly help that student become a better writer. 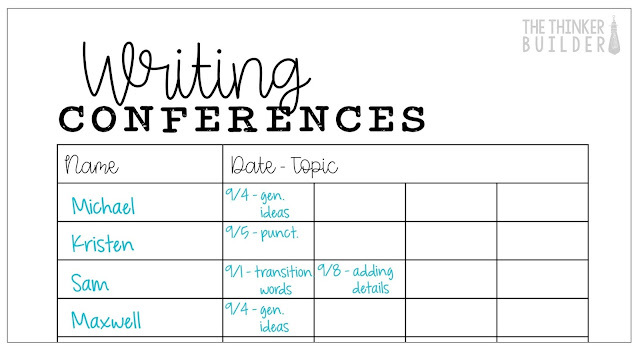 I encourage you to meet students at their workplace to hold these writing conferences, as opposed to calling students back to a table where you remain. When you are the one who moves to the student, it has a few advantages. First, you are in control of transition time. If you want to take a moment to record some notes, you can, but you are not waiting on any student to dilly-dally their way back to you. Second, when you visit a student at his/her desk, you are the guest. I always felt like this dynamic gave the student just a tick more confidence than when he/she came into "my territory." And I want the student to feel confident and open about his/her writing. Though I will coach and suggest and offer guidance, I want the student to remain the decision-maker. And third, when you confer at a student's desk, the students sitting nearby receive some "second-hand coaching," just by being there, giving you a little extra bang for your buck. You can learn all the ins and outs of having successful writing conferences with all my forms (including the one above) on my blog HERE. Especially if you've asked the class to try out the skill or strategy from your mini-lesson, doing a "quick-check" is a practical way to get a pulse of how well students were able to apply the new technique to their own writing. Let's say your mini-lesson was about using transition words to help your writing flow. And you ended the lesson with, "Okay boys and girls, I want you to try using a few transition words today while you're writing." After students have had some time to write, interrupt the class and say, "Please put a star in the margin next to a transition word you used today. I'm coming around to check. I'm so excited to see them all." Then take a marker and work your way around the room. I like to put a check mark in students' notebook to show I've seen their example. These aren't conferences. You want to get around to everyone in just 3-4 minutes. You're going to want to stop and help or coach some students, but instead, just make a list of students that could use some reteaching. Sometimes the skill/strategy doesn't lend itself to marking a single word. You can also teach students how to put a bracket around a section of their draft that best shows their attempt at the skill/strategy... maybe it's a sentence or paragraph. 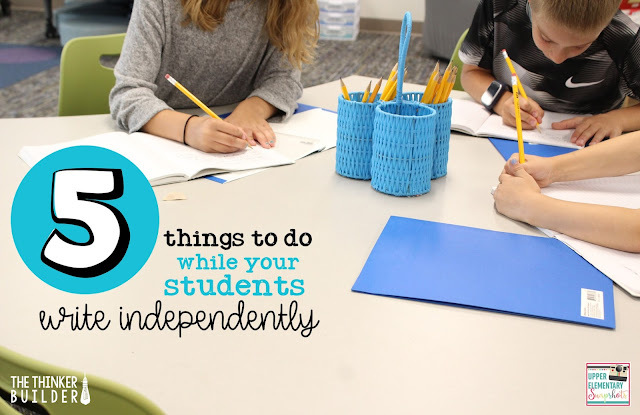 This might take you longer to check through them, and you might want to have students stack their open notebooks (open to the page with their bracketed section) to look through after school. Use patterns you notice from your writing conferences, or the list you made from a quick-check, to pull a strategy group. Maybe you have a list of five students from yesterday's quick-check on transition words who could use some re-teaching. So today, while the class is writing independently, you pull these five students back to you with their writer's notebooks and you review the lesson again, and have them try it out right there with you. Use strategy groups not just for reteaching and review, but also to push and enrich writers who are ready to make another jump. With a strategy group, you get a lot of bang for your buck: you already know these specific kids need this specific instruction, and you're doing so in a group rather than one on one, thereby making efficient use of your time. On certain days, try pulling three to four students back to a common table where you are sitting. Have them go about their writing with you nearby. 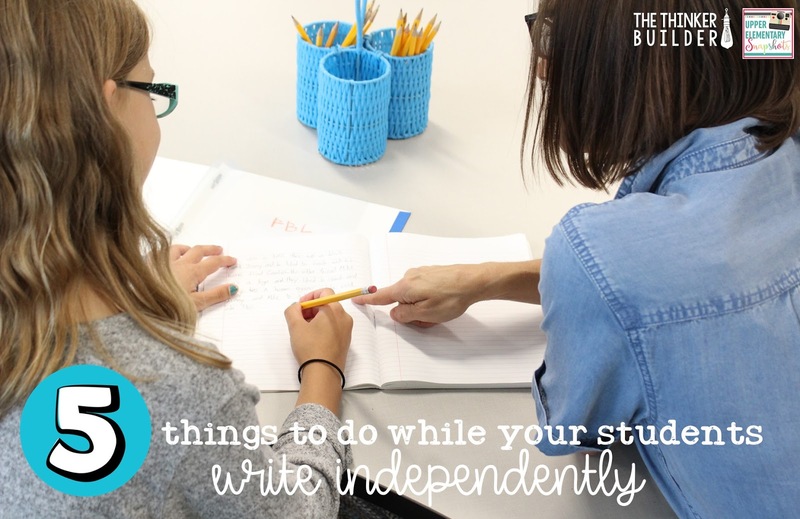 These students could be some of your struggling writers, but they don't have to be. I actually prefer to bring back a mix of writers. (You'll see why in a moment.) In this set-up, you aren't there to teach a specific lesson (like a strategy group). You are there more to guide and coach individuals as needed. I like to check in with each of the students at the table individually, getting a sense of what they are working on and offering guidance (similar to mini writing conferences), but as I'm doing so, I'm trying to find connections to the other writers I've brought back to the table. After this quick round of checking in, which doesn't last more than a few minutes, I then start initiating conversations between writers... "Hey Sarah, I noticed Robby here is working on his lead. He's trying to get the reader's attention a little better. Can you show him how you did yours? Robby, listen to Sarah for a minute." Or, "Hey Teddy, Max here has some dialogue going on with his characters. Will you show him that part in your story where you have some dialogue but also remembered to still explain what's happening around the characters?" When you have a group of writers at hand, you can use them to facilitate these valuable interactions. Having a couple of students share a strong example of a skill/strategy the class is practicing can be a productive way to wrap up your writing block. In order to to this, be proactive during students' independent writing time: search out and find a few of these examples and mark them with a certain symbol, maybe a little speech bubble in the margin of their notebooks, with a bracket around the section to share. As you look, be sure to gather a sense of the overall success the class had applying the skill/strategy (or combine with a more official quick-check). With a couple of minutes left, have the marked students share with the class just the small section that applies the skill/strategy. Often when we ask the class if anyone would like to share their writing, it's like opening a whole can of worms that is unfocused and lasts too long. With this technique, you get a productive couple of minutes that helps tie straight back to the focus of the day's lesson. 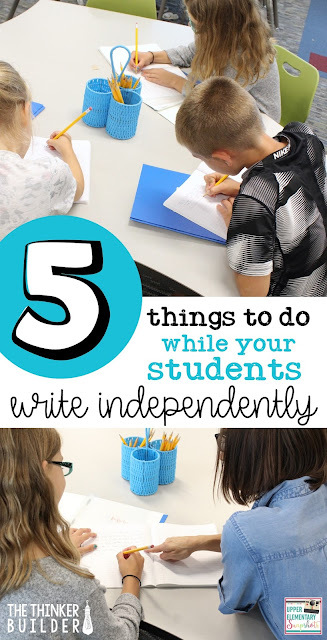 One of the most common issues that can prevent you from using independent writing time to really make a difference with your student writers is this sentence... "Teacher, I don't know what to write about." These story starters can eliminate that issue. 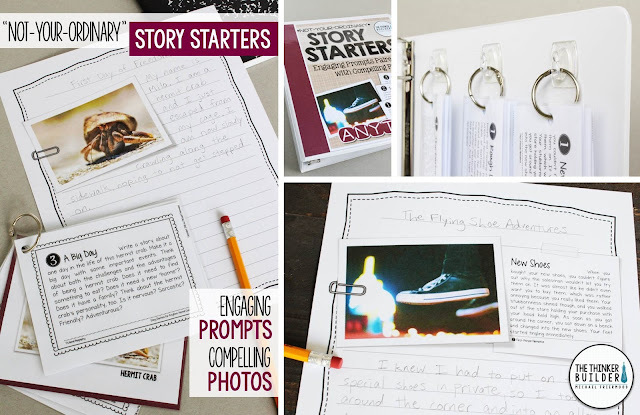 They use engaging prompts paired with compelling photos. And they are anything but ordinary. 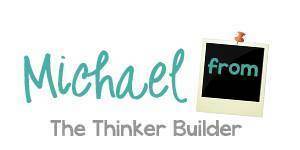 Try a set for free HERE, or check out my monthly sets HERE.